World Boxing Tournament is a game where you have to do your best to get a big score, to have the chance to reach the podium where are only the best of the best. There is an only chance for you to reach the top, to win the match very fast. In this game you are going to fight your friends in the ring. Do your best to hit them well in order to make them lose all their energy. If you win you will be declared the winner of the tournament. You can play also alone in this game and in that case you will participate at a championship. You can chose with your mouse a boxer at the beginning. Be careful at their advantages and disadvantages and then you can start the first match. If you win you will advance in the tournament where you will meet better fighters. If you lose unfortunately for you the game is over. Try again because only with training you can become a better boxer. After you win a tournament you will be ready to play and defeat your friends in this 2 players fighting game. 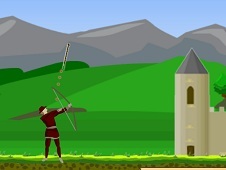 In the game you need the arrows to move around in the ring if you are the first player. You neeed 0 to defend yourself against the opponent and you need 1, 2, 3 to hit the other boxer. If you are the second player you need w, a, s, d to move around in the ring and you need space to defend yourself and m, b, n to hit. Do your best to take all the opponent`s life if you want to win the box match. You don`t have to worry if you don`t know how to play the game because you will receive all the necessary indications. leave us a comment to tell us what do you think about this new fighting game appeared on our site. This is a 2 players action game that I am sure is going to challenge you a lot. You need agility and focusing in this 2 players game. A like can help us a lot to promote this game for all the kids who love 2 players fighting games. World Boxing Tournament is one of the 475 games added to Fighting Games category, that we recommend you to play and then tell us your feedback through a comment in the dedicated section. The game World Boxing Tournament have been played 3303 times and this game have been added on 2-Player.com on 10 August 2017, this game have been voted 17 times, and his rate is 76%. This game have been commented 0 times from players that have been played this game.